Miami @ Virginia (ESPN): With Florida State losing at NC State this past Thursday there is, once again, the lack of a clear favorite to win the ACC. While most people don’t care about this sort of thing, as a fan of an ACC school I sort of have to. Sitting at 3-1 and in second in the Coastal, now is as good of a time as any for Miami to step up and show that they can take the reigns of the division. For the purposes of tomorrow, though, they should roll. Purdue @ Illinois (ESPN2): Both of these teams have two Big Ten wins in 3 or 4 games. Now, before you get too excited, the collective group these wins are over is Northwestern, Minnesota, Indiana, and Penn State. In terms of this game, though, I guess I’ll go with Illinois? I think it’s a tossup, though Illinois has beaten slightly stronger competition. And with the Zooker it’s hard to know which version of Illinois will show up at any given time anyway. Oklahoma State @ Kansas State (FSN): Provided Oklahoma State isn’t too upset about having their undefeated record spoiled by Nebraska last week they should be able to beat K-State. Syracuse @ Cincinnati (ESPNU): This isn’t last year’s version of either of these teams. I’ll take the Orange. Northwestern @ Indiana (BTN): I’ve got a hunch there’ll be a lot of points scored in this game. If I remembered that I get the Big Ten network I would probably even watch a little of it. Alas. Oh, and I’ll take Northwestern here. Tennessee @ South Carolina (SEC): South Carolina definitely took it easy in Nashville last weekend. Back in Columbia and with their human freight train Marcus Lattimore back, well, this should be an easy one for the Visor and Co.
Clemson @ Boston College (ACC): I swear if Clemson loses this game…. ugh. They should win easily against a team that hasn’t scored more than 21 points in any game this year. 2:30: Tulsa @ Notre Dame (NBC): All I have to say about this is that ND will probably win. Florida vs. Georgia (@Jacksonville, FL; CBS): The Cocktail Party returns, and both fanbases seem to be too busy talking about how the other is going to get blown out to really put any sort of analysis of this thing. Yes, UGA is on a three game winning streak. Those three games are wins over Tennessee, Vanderbilt, and Kentucky – the latter of which Florida beat earlier in the year 48-14. (Yeah yeah, transitive property doesn’t apply, I know.) Despite all their issues or whatever, I’m still picking the Gators. Michigan State @ Iowa (ABC/ESPN): The next two games feature undefeated teams that are underdogs. The conventional wisdom for this Michigan State team is that they haven’t beaten anyone on the road yet, but Iowa hasn’t really beaten anyone anywhere as they’ve lost to the best two teams they’ve played (Arizona and Wisconsin, the latter of which was at home). I like the Spartans here. Missouri @ Nebraska (ABC/ESPN): So Nebraska goes out and beats a defense-optional Oklahoma State team and all of a sudden they’re Big 12 North favorites again? Did I miss something? Did I miss the fact that the last time the Huskers faced a competent defense it was in the form of an extremely moribund Texas squad that had every reason to lose in Lincoln and then didn’t? Oh, and also that Missouri has a defense that’s been as good as Texas’s this year, if not better? Jeez, what do you have to do to get some respect? I like the Tigers. Arizona @ California-Los Angeles (FSN): UCLA has lost their last two games (vs. Cal and @Oregon) by a combined total of 95-20. Arizona is not quite that explosive but it would be very difficult to take UCLA here. Wake Forest @ Maryland (ESPNU): Maryland should get bowl eligible for the first time since 2008 here. Duke @ Navy (CBSCS): Navy. 6:00: Auburn @ Mississippi (ESPN2): While not projecting an aura of crazy that’s as strong as Les Miles, weird things do tend to happen around Houston Nutt. Such are the challenges Auburn will face in its quest to hang on for the perfect season that, unlike 2004, will payoff this time. Provided Auburn clears this hurdle, and they should, their remaining schedule is UTC, UGA, and @Bama. While UGA is a rivalry game, they shouldn’t be troubled again until they make the drive over to Tuscaloosa. Baylor @ Texas (FSN): Running out of time here, but Texas has lost its last two home games. To UCLA and Iowa State. That is not exactly a murder’s row of teams there. I think Baylor can pull this off. Stanford @ Washington (Versus): Stanford. Kentucky @ Mississippi State (ESPNU): This is an intriguing match, and we could see a lot of points here. I like the cowbells. 7:30: Utah @ Air Force (CBSCS): Air Force is probably the most interesting team Utah has played this season (other than now-Big East favorites Pittsburgh to start the year). I like the Utes to pull away in the second half here. Ohio State @ Minnesota (ABC): Yes, that’s right America, no reverse mirror for this game. So if you’re in the Midwest you’re still with the impending beatdown Ohio State is about to lay on Minnesota. The Oregon-USC game will be on espn3.com at least. 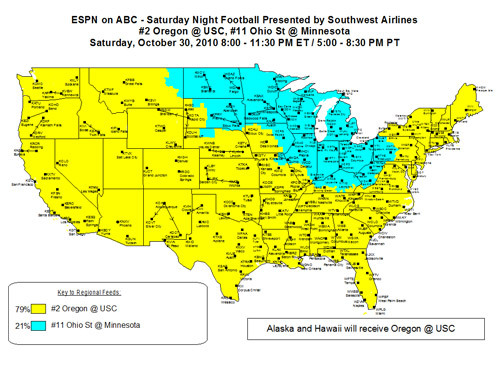 Oregon @ Southern California (ABC): The rest of the country will see this game. I mean, this should be a beatdown as well, but at least it’s got the potential to be interesting. Michigan @ Pennsylvania State (ESPN): Instead, many eyes may be here (well, or on Utah-Air Force, or Baylor-Texas… you get the idea) to see which of these Big Ten teams get out of their recent conference funk (though Penn St. did notch a win against the hapless Beavers last week). While the Wolverines haven’t shown any ability to play defense this year, that shouldn’t be a problem against a Penn State team trying to find an answer at quarterback. The only major problem may be the location factor – Happy Valley at night on Halloween may be a little less happy – but I still like Michigan here. 9:15: Colorado @ Oklahoma (ESPN2): Cody “Son of Coach” Hawkins will start for the Buffs in Norman. He’s going to need all the help he can get, but the main objective for Colorado here is probably avoiding the blowout so Dan Hawkins can at least have the dignified “end of season” firing instead of the midseason variety. Sooners should roll. 10:30: Utah State @ Nevada (ESPNU): Since beating in-state rival BYU, the Aggies (that’s Utah State) have scored 13 points combined against Louisiana Tech and Hawaii. While allowing 69. Nevada’s crept back up into the rankings since their 6-point loss to the Hawaiians two weeks ago, and they will probably stay there for at least another week. 11:00: Texas Christian @ Nevada-Las Vegas (CBSCS): I just went to look at UNLV’s schedule on espn.com and a highlight video started autoplaying featuring the headline “TCU Blanks UNLV 41-0”. From last year. I wouldn’t be surprised to see history repeat itself here. Horned Frogs roll. With each passing week, it gets just a little easier to do the bowl predictions. Expect a fairly quick turnaound after this weekend. Will we see a new #1? Probably not. But if Vegas is right, we’ll have some shakeups around the 5th and 6th ranked teams. So settle in and enjoy, this weekend (especially the 3:30 games) promises to be a fun ride once again here in the return of Bizarro Year. This entry was posted in college football, On TV This Weekend on October 30, 2010 by ASimPerson.